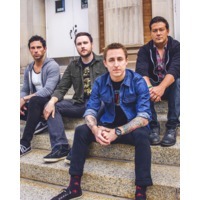 Yellowcard is an American pop punk/alternative rock band formed in Jacksonville, Florida in 1997, and based in Los Angeles, California since 2000. Their music features the use of a violin, unusual for the genre. They are best-known for their songs "Ocean Avenue", "Only One", "Lights and Sounds", and "Light Up the Sky". The band announced their return from a two-year hiatus in August 2010 and has completed recording their latest album, When You're Through Thinking, Say Yes, due for release in March 2011.